THE SPOTTED HARE: Well hello there . . .
We have a winner on the drawing!! Congratulations to TAMMY SHELTON ! I hope you love your wee robin! 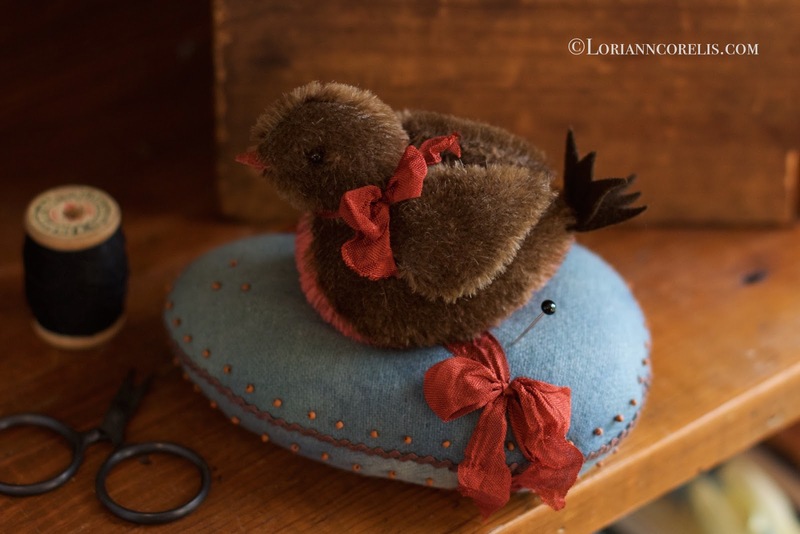 A sweet mohair robin with thread jointed posable wings sits atop a hand dyed woolen egg. ribbon completes the piece. Nicely weighted. 6" x 4.5"
ribbon completes the piece. Nicely weighted. 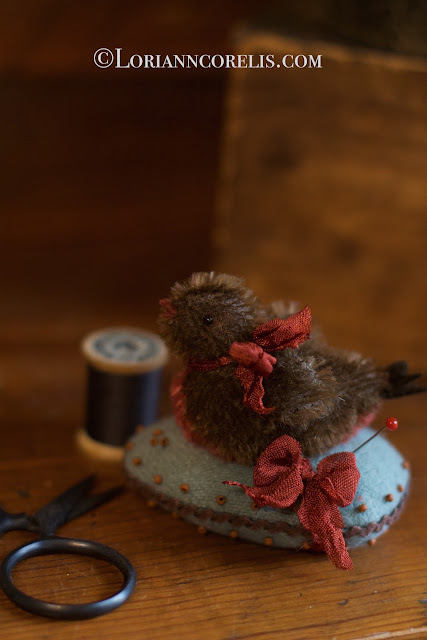 ~ 6" x 4.5"
Sweet mohair robin with stationary wings sits atop a hand dyed woolen egg. ribbon completes the piece. Nicely weighted. 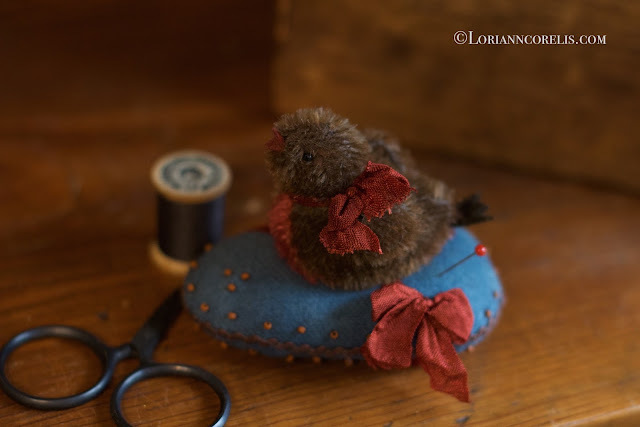 Sweet teeny mohair robin with stationary wings sits atop a hand dyed woolen egg. and glass beads. 2 little eggs are blanket stitched as well. 6" x 5"
AND LASTLY ~ A GIVEAWAY! I missed holding my birthday giveaway this year as it fell on a busy Mother's Day. on this blog post! (leave your email as well if your comment doesn't link to one). OR . . . pop me an email! We will draw one lucky name Friday evening about 7pm. So happy to see you are back and your magic fingers producing such beautiful work. You have had a long recovery and I hope you are doing well now. A Happy Belated Brtthday wish also. I would love to win your little Wee Teeny Robin Pinkeep. I'm so glad you are doing well and creating such adorable critters for all to enjoy!!! Happy Belated Birthday!!! Good to see you back! I hope you are improving every day. I would love to win this little Robin Pinkeep! I understand long recoveries. I suffered a serious fall at work four years ago and continue to deal with the aftermath. The disappointing truth is one never returns completely to the "before" stage after a traumatic injury. But enough with the pity parties, I'm glad you are creating your lovelies. These birds are delightful and reflect your spirit to soar. That little one would find a happy home with me. Happy belated birthday to you !! It is good to see you back on your blog. I am thinking you are back to normal again ?? Healed up ? Please enter me for a chance to win your delightful handwork. I would just love to win that adorable little robin. Thank you for the chance to win. I've missed seeing your cuties here. Hope you are dancing pain free. ;-) I''d be so happy to win that sweet birdy. Glad your back. Wonderful pin keep, would love to win, thanks for the chance. My goodness how sweet are those tweets! Oh I made a rhyme ! Your creations are so darling. I treasure my little mousie on the tomato. I love every one of the Robins you made, they are just too sweet. I'd be thrilled to have an opportunity to win one of my very own! Thank you so much for this wonderful opportunity and give away. I wish you a Happy Belated Birthday and send wishes for a fun year ahead. So wonderful to hear you are on the mend. Sorry I missed your sale. Hope I have enough luck to win this darling little bird. Happy belated Birthday to you Lori! I just adore your work. Such fine workmanship. Everything you make brings a much needed smile to my face. Have a wonderful day. I just live on the other side of town from you. Have a great day. Such a nice giveaway too!! Your pieces of art sell out so quickly. They inspire me in my work on a daily basis. Happy birthday and let us know when the next sale will be up. I will be camping out for it! I would love to be the winner! Email: paracletedesigns@gmail.com. Oh, I hate that I missed out on these! They are so sweet! I would love to be the winner. So happy you are back and working again. Happy Birthday! So very cute! Would love to win one! Birthday and Mother's Day.....busy, busy lady! And you still had time to make these precious little birdies. Your teeny robin pinkeep would be so welcome and taken very good care of if he flew to my house. Hope you had a great Mother's Day and a fabulous birthday!! Adorable ... as are all your creations. Happy belated birthday too. We share the same one :~). Thanks for the opportunity to win. Like all the other ladies, I would love to win your beautiful pin keep. Thank you for giving us all the opportunity too be a part of of your giveaway. Love your blog! What a thoughtful and generous way for you to celebrate your birthday... giving someone else one of your darling creations as a gift! Hope your birthday was as special as you are and thank you for the chance to win this sweet little pinkeep! Happy Belated birthday. Thank-you for the chance to win the precious looking robin. 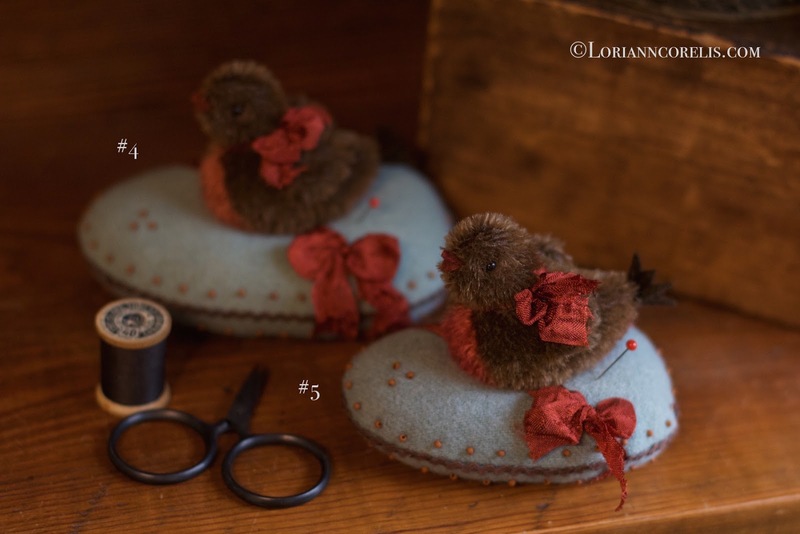 I just found your blog from three sheep your birds are so darling. The entire flock is just lovely! 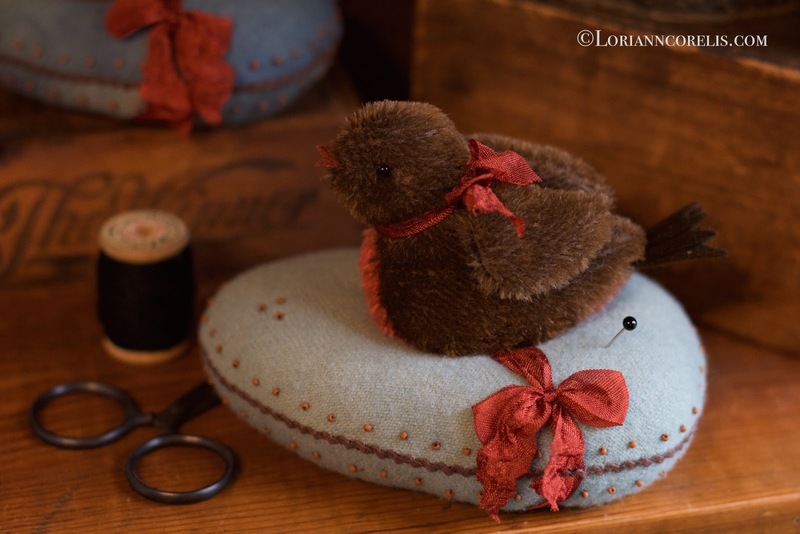 I'd be ever so delighted to have this last little birdie residing in my sewing room! Thanks for the chance! Happy, happy belated birthday. I hope you are healing a little more each day. 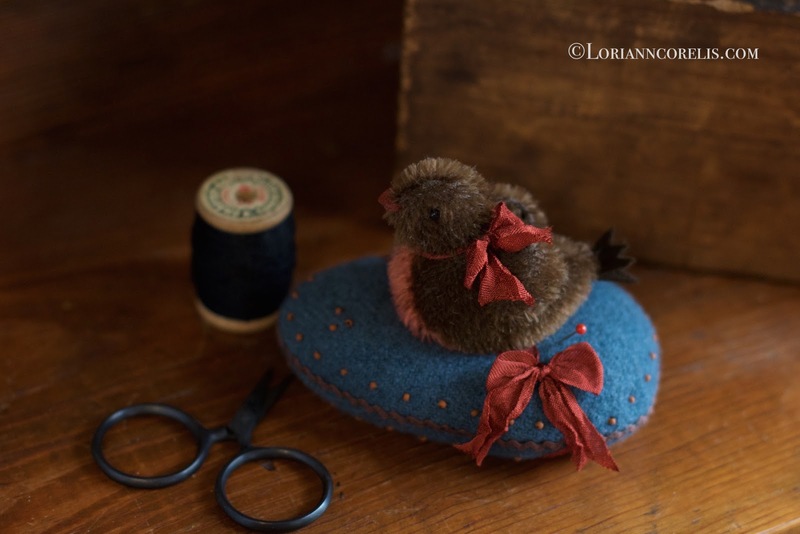 I love your work and am thrilled to have a chance to win this little bird! Thank you! thanks for the great giveaway...would love to win your cute pin keep. I'm so sorry to have missed your sale!!! I love your little birdies!!!! Hope you had a great birthday, even with a broken leg. Someday I will get to Spring Mercantile. It sounds like a woolie heaven. All of your birdies on the eggs are wonderful. It would be a great keepsake to win one. Happy Spring. Happy Birthday (belated). Would love to have this smaller companion to the one I made in your class!! Happy Belated Birthday! Would love to win your sweet little bird! Is this still on? I've been on vacation but sure would lovee one! So cute! I missed your class and sale in Peninsula. Thanks for the giveaway. I love your pinkeeps! Haven't seen one yet I didn't like! Wishing you a belated Happy Birthday. May this year bring you much joy! Your creations are so special, love them all! 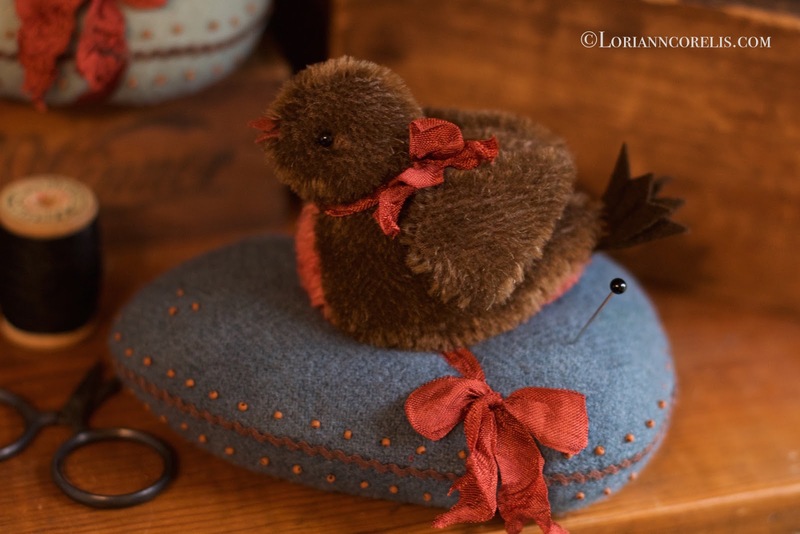 Lori Ann, I am so thrilled that I was able to procure one of your sweet birds, and I look forward to receiving him! Thank you! Your work is endearing and beautiful! Oh please enter me in your drawing. I love your little creations. They are so cute! I love this sweet Robin! O wauw, how lovely!! I would like to win this little sweety!! I have a litle red robin pair in my garden who have a nest with little babys, I just love they choose my garden for their nest!! So glad to hear that you are slowly returning to normal. I love all the beautiful things you create and so happy to see you back here! Thank you for all your tweet comments!!! You're work is exquisite. After enjoying myself so much at last year's, From Our Hands, I was disappointed not to be able to attend his year. My fingers are crossed that I'll be there next time. So wonderful that your recovery has continued to the point of being able to return to your darling creatures. And how lovely that you are so sweet to celebrate your birthday by gifting one of your readers. Belatedly, Many Happy Returns! 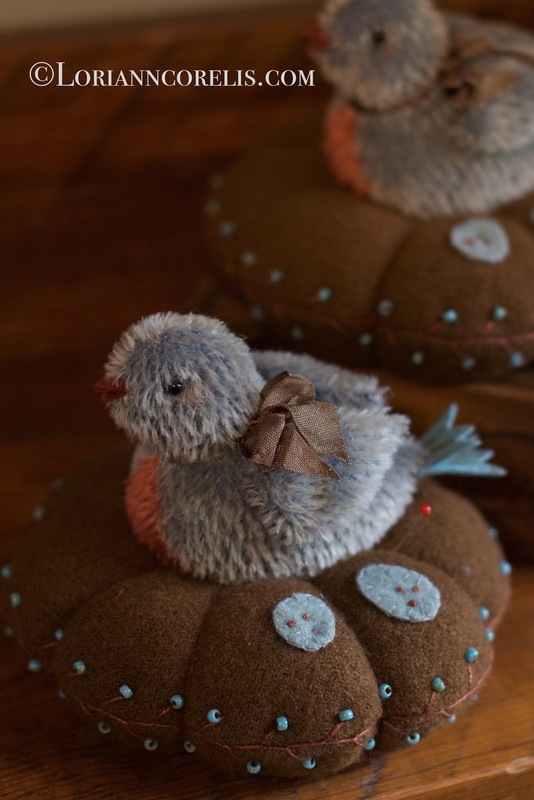 I LOVE your sweet birdie creations! Hopefully next time you have a sale I will be able to get one of your treasures. Please, please enter my name in your Birthday Give-a-way drawing. THANK YOU! I'm new to the Blogging scene. Apparently I had to log in to my daughters account to be able to post on your Blog, LOL! I'm so confused! I'm slightly technology challenged. Thank ou so much for all your entries and comments! Congrats go to Tammy Shelton! Thank You!Thank you! Thank you! so love your work, hope to get to one of the shows in Ohio one of these days. Glad you are on the mend. All of your products are adorable and I love them all.